Get a professional water line repair by Clovis Plumbing Services! The water lines that provide our homes with potable water are critical to our well being. Even so, their importance is often taken for granted until they require maintenance. Water lines bring clean drinkable water into our homes to wash, cook and consume. Because of this, it is vital that water line repairs are performed properly and replaced when necessary. Water line repair can be expensive, but you can save significant time and money by choosing the right plumber. Never try to perform any kind of water line repair if you are not a trained and licensed professional. Repairing a water line improperly can lead to even more costly repairs, serious damage or injury. Always call a professional whenever it comes to working on water lines. Make sure that you get more than one opinion when it comes to repairing your broken water lines. It is extremely possible for some companies to charge more than necessary to fix the problem. Call several different companies to diagnose your water line problems and give you an estimate of what it will cost. Make sure you only contact companies that provide free estimates. You should remember that it does cost a substantial amount of money for a water main repair. Once it has been determined that your lines need to be repaired or replaced, you should never postpone them. By ignoring water line problems, you could put your home, health and safety of your family in jeopardy. While a clogged drain can be put off temporarily, a water line needs to be addressed as quickly as possible. Have you noticed anything unusual about your water lately? If so, it is possible that you have a ruptured water pipe. These pipes are what carries fresh water into your home. Therefore, it is important that they stay in optimal condition. Too little water pressure could be a symptom of a broken line. A decrease in pressure can be caused by various sanitary problems. However, if your water stops flowing at some point, there are signs that the waterline is broken. Once you notice a significant change in the pressure, you need to call a plumber immediately in order to prevent the line from breaking. Another sign of a broken water line is a high water bill. A broken water line will result in the loss of a significant amount of water for which you are paying for. Every time you notice a strange increase in your utility bill, it may be due to a problem with your plumbing. Keeping a good eye on your utility bill can help you discover plumbing problems quickly. If you also see a lot of puddles in your yard, you might have a broken water line. By not having the problem fixed, you could face even more damage to your plumbing and your yard. You will need to have a plumber come out to fix the problem as soon as possible. A serious indication of a damaged pipe is the presence of dirt or other contaminants in your water supply. If lines are broken, debris can enter your system. The water looks brown or cloudy when you turn on a faucet. This can be dangerous to your health, especially if you are taking in contaminants. Keep a close eye on water consumption. If you notice any of these issues, it is crucial that you call a plumber as soon as you can. In some situations, water lines can be repaired using a repair coupling. In more antiqued houses, however, this approach is at best temporary. With older homes, a leaking pipe is a signal that other pipes may also be ready to fail. To understand whether your plumbing system is stable, contact a licensed plumber as soon as possible. If your whole piping system is outdated, it may be best time for a repipe. Although this can cost hundreds of dollars, a new water line will reliably perform for decades to come. 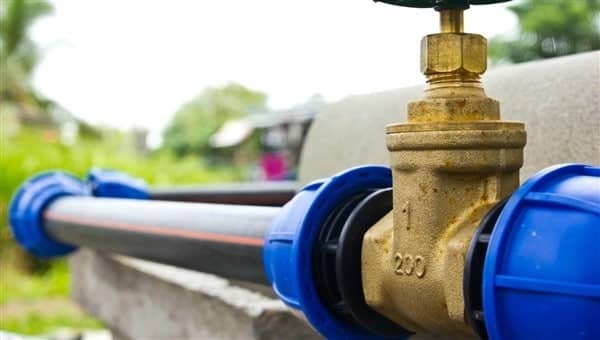 The main waterline in any house is the most important plumbing fixture for the water supply. This plays an important role as it distributes water from the main into the various branch lines of the house. Assessing and monitoring the working of the water-line needs the professional expertise of a plumbing expert. We are an industry leader for water line repair as we provide fundamental solutions to water line issues. A perfect and smooth running water line is essential for so many reasons. With multiple branches of water pipe across the house, even a small problems can lead to a problematic water line. Rust in the waterline pipes leading to an unpleasant taste and serious health hazards. Leaking of the waterline pipes which can waste a lot of water. General wear and tear in the water lines with time, demanding costly repairs in long run.